Editor’s Note: You can learn more about community measurement strategy by enrolling in our CMX Fundamentals of Community Strategy online course. Learn more here. 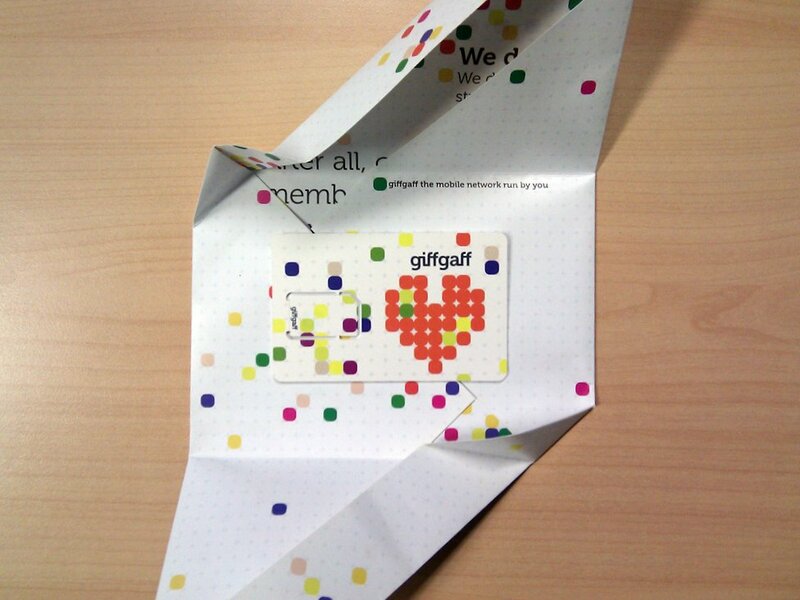 In 2010, Giffgaff launched a customer support community that today is the source of nearly all of their customer support. Customers get answers to their questions in this community in an average time of three minutes. Most of us wait longer on hold with phone support than that. Of course, Giffgaff didn’t just wait for these results to magically happen. They started with a pre-launch plan, worked diligently to foster engagement, and continue to listen and give back to the community in innovative ways. When organizations see the success of program’s like Giffgaff’s, they often think that duplicating their success will be a snap. One of the biggest myths around customer support communities is the old, “if you build it, people will automagically come and use it.” That’s simply not the case. While we know from the case studies that support communities can have incredible results, fueling retention, satisfaction, and reducing costs, these communities don’t build themselves. You not only have to think about driving your customers to post their questions in the community, but you also have to make sure they are getting answers in a timely fashion that offer helpful solutions too. In order to set your community up for success, you must ensure that you’re measuring for the kind of success you want to create. Let’s dig in to the three biggest mistakes that community professionals make when setting up their measurement strategy. There’s a lot of tactical day-to-day work that goes into building a community, especially when it is new. You’re replying to members’ comments, creating daily content, sending e-mails, and jumping on calls with members. It is very easy to get so bogged down in the tactical work of growing and managing the community that you forget to focus on the big picture. When you jump into the execution phase prematurely or only focus on the day to day tasks for too long, you can wind up putting your community in a precarious place down the road. You need to think about what success looks like for this community in 30 days, 90 days, six months, and a year, and then set regular evaluation points along the way. When you hit the evaluation points and re-visit your strategy, back up your progress with hard data. Hard data in regular reports (usually weekly or monthly) is how you can consistently show the ROI and value of the community. Did you hit the growth KPIs you hoped to hit in the first 30 days? Were you able to close the feedback loop on more community questions and ideas in the last 90 days? Figure out the key business need that your community addresses and measure your progress toward meeting that need at regular intervals. Vanity and engagement metrics are metrics like the number of new members, number of new posts, total posts, and total followers. Most community platforms and social media analytics tools have “ready-made reports” where you can download all of these stats in pretty charts. However, these charts can distract you from the big picture (remember Mistake #1?). These metrics can be helpful for short-term tracking to identify and inform your day-to-day work, but they mean absolutely nothing to your boss and other departments within your company without putting them into additional context alongside your core business goals. Instead of throwing a bunch of vanity metrics into a report, you should focus on 1-3 main KPIs, defined with your team. In support, these KPIs need to tie back to a financial metric (e.g. increasing sales, retention, increasing LTV, or decreasing support costs).When you have 1-3 main KPIs, you can more easily put these KPIs into context and tell a story with the data. Telling a story with your data is just as important as collecting the data in the first place. What do I mean by that? It is not enough to just have the KPIs in a report in each week. 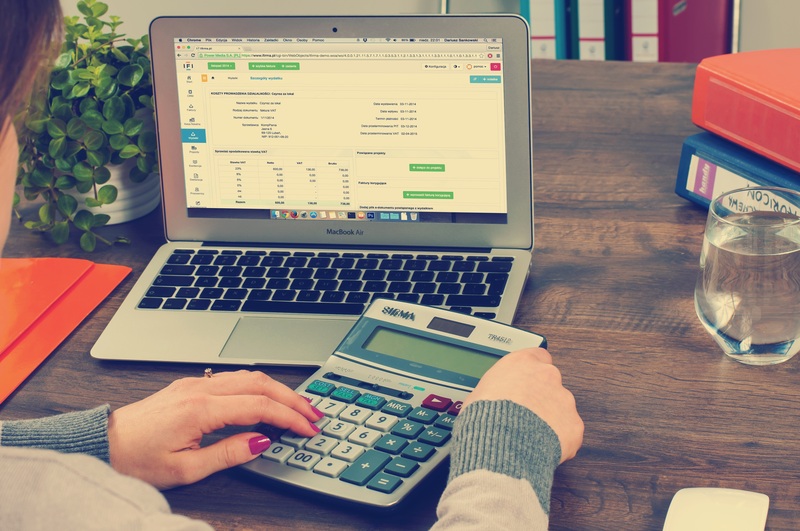 You need to be able to show how the KPIs are changing over time and how specific variables in a given week, month, or more are impacting your community’s success. For example, if your product had a three-day long server outage and the number of questions in your community tripled that week, and the sentiment was overwhelmingly negative in the community, you will want to add this to the report to paint a picture around the metrics you share. This added context is necessary to complement your data. This ability to self-edit, add necessary context, and tell a story with the data is crucial to better convey how the community is impacting core business goals with busy VPs and C-level executives. They want to see growth, in one way or another. They don’t have time to read a 20-page report. The faster you can convey what is working, the better. It will make your job so much easier when you need to get buy-in to purchase that new fancy piece of software or hire your next team member. For most customer support communities, the KPI that community managers gravitate to is call or ticket deflection. This makes a lot of sense. Deflection is probably the easiest KPI to measure, assuming you know the total volume of each support channel (phone, email, etc.) and how many questions are asked and answered within your community. Then, you can identify how many support cases your community is answering (or deflecting) from more traditional, costly support channels like phone, chat and email. But when deflection is your one and only KPI, you have a tendency to obsess over it at all costs. I know what you are thinking: That’s great! I want to deflect all the cases from phone, chat, and email that I can. However, when you focus solely on deflection, your judgment gets cloudy. It can lead even the best intentioned people to do things like hide the company’s support phone number and email and only surface FAQs, Knowledge Base articles, and community discussions. When that happens, you force people to go to the community against their will. People may get frustrated searching and just give up. Or they get no response in the community. Or, even worse, they get the wrong answer or unhelpful responses. All of these things above count as “deflection.” However, the overall experience and sentiment for your customers varies wildly. Make sure to take that into account too. The key to avoid falling into this trap is to balance your deflection KPI with a customer experience metric. Customer experience metrics tend to be survey-based. The most common ones are First Contact Resolution, Customer Satisfaction Scores (CSAT), and Net Promoter Score (NPS). While it is fairly easy to measure customer experience for traditional support channels (you just survey customers at the end of their phone call, live-chat, or in a follow-up email), it is more difficult to do in an online community. You can’t exactly send an e-mail to every single person in your community after they ask a question. Well, you can technically can, but it is going to be annoying, off-putting, and potentially stalkerish for your members. I don’t recommend this approach. That doesn’t mean you shouldn’t measure customer experience. The lowest barrier to entry way of measuring customer experience in an online community is to run a quarterly Net Promoter Score (NPS) survey in your community. If your community is larger or more active, you may want to experiment with running this survey monthly to a randomized set of users. This gives you a way to correlate deflection with customer experience in a meaningful way. As seen in this chart, you need to find a sweet spot where you deflect as much as you can without sacrificing customer experience. 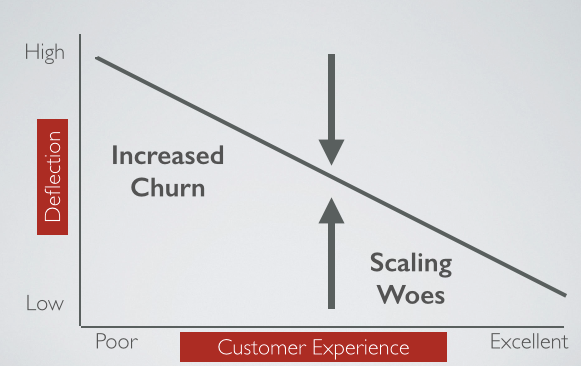 If you focus too much on deflection, it leads to poor customer experience and increased churn. Likewise, if you overcorrect too much where you deflect almost nothing, you will run into scaling problems. To quote Jay Baer, “80% of brands think they deliver exceptional customer service. Only 8% of customers agree.” Let’s close that gap in our support communities. When you first launch, you should personally welcome and make every member in your community feel like a rockstar by delivering an amazing, over-the-top community experience. Your goal should be to make every single new member feel great about being in this community. As the community and the overall support team gets larger, you can start to pull back and figure out what you can automate, how to solve the most common support issues rapidly, and where you can get community members more involved in the support process. If your customer support community is large and established, you can still implement some of these practices. It just takes a little more planning. The biggest thing you can do to start off is to simply spend at least two weeks engaging in active listening and sentiment analysis within the community. The goal is to identify the most common questions, most common issues, pain points that members have, etc. It is also a good idea to identify and personally reach out to your top 20 contributors. Set up a time to chat for 15-20 minutes and get their honest feedback about the community. An additional benefit of setting up these calls is that when you start implementing their feedback in the changes you make, they are going to be way more likely to stick around in the community if they know you are listening and care enough to make changes based on their feedback. It’s that kind of win-win situation that makes support communities so alluring to so many companies.